The two millionth Fiat 500 was made at the Tychy Plant in Poland today. The 500 is market leader in nine European countries and in the top three in seven more. In its eleventh year and with nearly 60,000 units sold in Europe during the first quarter of 2018, Fiat 500 has just scored its best quarter ever. 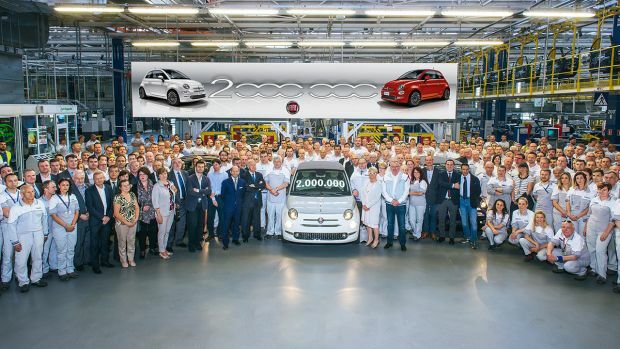 The two millionth Fiat 500 was made at the Tychy Plant in Poland today. It is a Fiat 500C Collezione, sporting an exclusive two-tone white and grey Primavera livery and powered by a sparkling TwinAir Turbo 85 HP engine. It will be sold in Italy. The new special series celebrates the timeless style and design of 500, its famed iconic status and its ever-fashionable personality with new colour and material combinations and a cool and stylish spirit. It comes packed with exciting standard equipment, such as 16-inch rims, chrome-plated accents, a grey/white/grey beauty line and the cursive “Collezione” badge on the tailgate. The production of the two millionth car is a proud new milestone in a remarkable success story. The great little iconic Fiat is sold in over 100 countries worldwide. Over 80 percent of sales are outside Italy and for five years it has been the bestseller in Europe in its segment*, with a market share of 14.6% at the end of 2017. Furthermore, in its eleventh year, nearly 60,000 units were sold in Europe during the first quarter of 2018 – an all-time record for the current 500. Again, during the first quarter of 2018, the 500 was the market leader in nine countries (UK, Spain, Belgium, Switzerland, Portugal, Austria, Hungary, Croatia and Slovenia) and was in the top three in seven others (Italy, Germany, France, Sweden, Slovakia, Romania and Bulgaria). The 30 special editions launched over the past 11 years, counting both Fiat and Abarth, are one of the secrets of the uninterrupted success of the Fiat 500. Fiat 500 has always been a trendsetter that while remaining true to itself has been re-interpreted over time in an array of special editions created to explore unusual territories for a city-car, from fashion and luxury yachts to connectivity. The new Fiat 500 Collezione special edition, which nods to the fashion world, follows in the steps of the limited editions – the 500-60esimo and the Anniversario – released last year to celebrate its first 60 years. The 500 was first introduced in 1957 and over six million cars have the sold since then. These key numbers sum up its strength in the collective imagination as well as on the automotive scene. Throughout, it has remained relevant to various generations of motorists. It is the emblem of mass motorisation and a product of real social relevance. Not by chance, a car from the F series of 500, made in the years from 1965 to 1972, which was the most popular version ever, was inducted in the permanent collection at MoMA, the famous Modern Art Museum of New York. Production of the iconic Fiat started in Tychy in 2007 when the new model was introduced. It was named Car of the Year – the result of its very high manufacturing levels – that same year. With more than 200,000 units made a year, counting both Fiat and Abarth, today the Polish plant is one of the most advanced FCA factories in the world. It was one of the first to receive a World Class Manufacturing Gold certification.